Pollination Infatuation | Idealist Girl! I’m a little infatuated with pollinators. A few years back I attended the Bioneers Conference in the San Francisco Bay Area and began to learn about pollinators. Sure I knew about bees and butterflies, but I had never really considered that hummingbirds and bats might be pollinating right in my own backyard. As soon as I started thinking about pollinators, I began to read some scary projections that pollinators were facing extinction-level threats. Lack of pollinators means lack of crops. Since I happen to be a fan of food, I thought it might be time for me to get involved in backyard pollinator preservation. My backyard is what is lovingly called in these parts a “Wallingford postage stamp.” The footprint of our house is not big, but even so the backyard has only 500 square feet of space in it. Most of which is in the shadow of our very large and old Asian pear tree and the neighbors’ even larger cedar. The result is that I have to squeeze all of my urban homesteading tendencies into a very small space, along with the kids’ sandbox. Which is why I decided to start small, with the orchard mason bee. The orchard mason bee, a lovely little bee without a stinger, is a pollinator native to these parts. 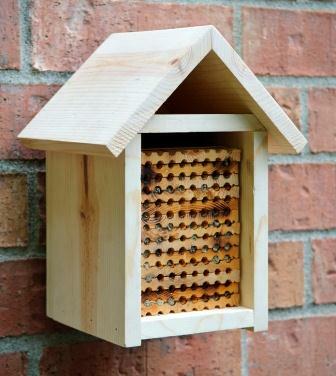 I bought a little bee house for my orchard mason bees and some bee cocoons, which I set out once I saw flower buds appearing on the pear tree. It was such a lovely and easy thing to do, watching the tree for buds and then setting out the bee cocoons so that the bees would emerge just in time to sip the fresh pollen from the pear flowers. It worked so well that I collected 3000 pears from the ground that summer, in addition to the ones we and our neighbors picked and ate, and the ones which we harvested for our local food bank. Holy smokes! The following summer I planted flowers that attract hummingbirds. We have several native hummingbirds in Washington, with Anna’s hummingbird being the most common. Foxglove grows as a weed in my yard, so I merely added a few tasty hummingbird plants to it: bleeding heart, fuchsia, delphinium, penstemon, columbine, and evening primrose. All of them have proven easy to grow and winter well, which is important since my flower beds are alternately known as “Darwin’s Garden” with only the fittest, most low maintenance plants making it from year to year. My flower planting spree had the benefit of attracting a number of butterflies as well, and ground-dwelling bumble bees. Last summer I discovered a bumble bee den in my front yard, nestled under some composting leaves and rocks. Until that moment, I didn’t realize that bumble bees lived a fairly solitary life, and not in a hive but in the ground. Last summer I also placed a bat house in a sunny spot on the south side of the house. I think we had a bat resident living there by summer’s end, though possibly it was a sparrow. Whoever the bat-house-resident was, it stuffed the house with moss, which the bat ladies at the NW Garden Show said indicates an avian friend, not a mammalian one. I am hoping that this summer we get a resident bat so I can officially start my journey toward being a bat lady. Which brings me to this year, in which I officially embark on a beekeeping adventure. Honey bees. Beekeeping suit. Queens and drones and workers. I think I am going to place my hive on the roof where it’s sunny and out of the way of the kids. I have an appointment with Corky, Seattle’s bee guru, this Thursday to once for all sort out which type of hive and which variety of honey bee I want to begin with. I am leaning toward Italian bees (they are rumored to be lovers, not fighters). I would really like a non-commercial hive, like a top bar hive where the bees can built their own comb. But the vast majority of the resources out there are for the Langstroth hives. So we’ll see where that goes, for this year at least. Next year there may be three hives on the roof and matching beekeeper suits for the whole family!